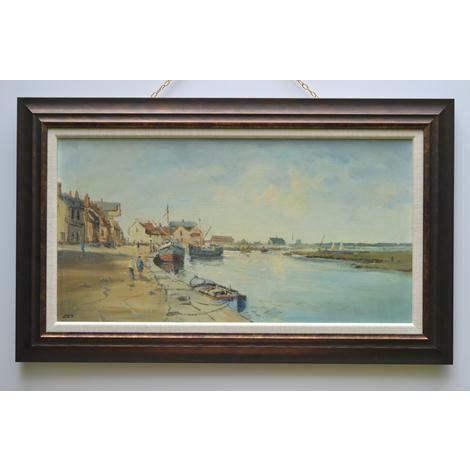 This painting offers a luminous view of Wells-next-the-Sea, once a small fishing port on the North Norfolk coast. Now, the harbour is silted-up, the North Sea a long mile away. There is still a hint of activity - the small boats with shallow draught and the distinctive, overhanging gantry which belonged to the granary. But the main features of this composition are space and atmosphere: in the blue of sky and sea and the haze which softens all it touches, there are intimations of the endless North Sea and The Wash which lie beyond the sheltering harbour.